Classses contain in packages of other programme can easily be used. In packages,classes can be unique,compare with classes in other packages. Packages provide the way to hide classes thus preventing other program(or) packages from accessing classes that are meant for internal use only. 1.java.lang:language supports classes.These are classes that java compiler itself uses and therefore automatically imported.They include classes for primitive types,stirngs,maths,threads and exceptions. 2.java.util:language utility classes such as vecotrs,hash tables,random numbers,date etc. 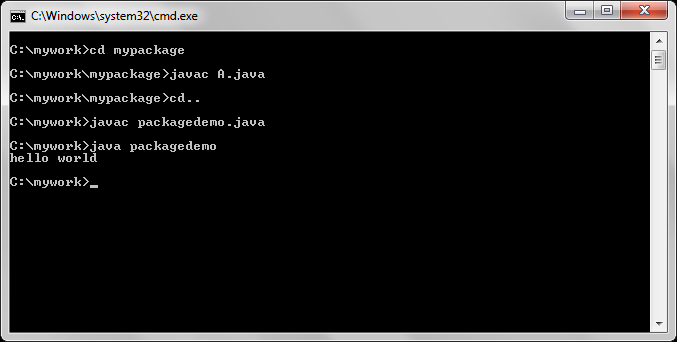 3.java.io:input/output support classes.They provide the facility for input/output of data. 5.java.net:Classes for networking.They include classes for communicating with local computers as well as with internal servers. Today we shall create a user defined package.For this we need to create a folder with your desired name. Now we have created a package.We shall now reuse the above defined class in other program. This entry was posted in Java and tagged importing packages in java, list of packages in java, packages in java ppt, packages in java tutorial, packages in java with example, packages in java with example pdf, packages in java with example ppt, packages in java with example program, user defined packages in java, user defined packages in java with example. Bookmark the permalink. 1 Response to Packages in Java with Examples…!!! Pingback: Programming with Packages…!!! | letusprogram....!! !